U-Fab Interiors Celebrates 10 Years with Event to Support Local Homelessness and Addiction Services - CARITAS - Shelter. Jobs. Recovery. Hope. On October 19, Richmonders will step into u-fab’s showroom on Broad Street after hours. They won’t be shopping for their regular furniture and upholstery items. They’ll be there to discover and bid on one-of-a-kind chairs created by local designers and artists including Ed Trask, Katie Ukrop, and Susan Jamieson among others. They’re all joining together to raise funds for CARITAS, Richmond’s only nonprofit dedicated to finding solutions for both homelessness and addiction. Why? There are a few reasons. 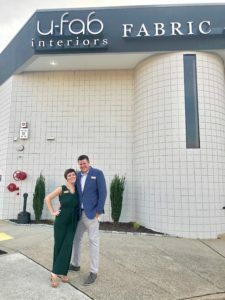 Owners Carley and Travis Hamilton have been working with the nonprofit’s Furniture Bank, which provides between 800 and 1000 individuals and families with furniture and essential household items each year. They regularly make donations of furniture from their clients and from the showroom floor. Within days, those pieces often go right into the homes of people transitioning out of crisis. The company also recruits employees from the CARITAS Works program, which helps men and women in transition prepare for employment. The connection to CARITAS goes even deeper.The Hamiltons have witnessed the negative impacts of substance use first-hand in their family. They are still dealing with the consequences. Carley’s mother struggled with substance use most of Carley and her six siblings’ lives. Carley bounced from her mother’s care, grandmother’s home and eventually lived with her biological father as a teen. It got hard. While in the grips of addiction, her mother stole from Carley and struggled to stay sober and take care of any of Carley’s siblings. Carley often stepped in and now has guardianship of two of her younger siblings. Carley’s mom overdosed nine years ago from lethal doses of alcohol and oxycodone. Carley was one of the first members of her family to attend college. She met Travis at VCU. Travis brought the u-fab concept to life in 2008 with original partner Mike Dender. As it grew, Carley joined the team. “We’ve built this from the ground up and now we want to give back to a cause that means so much to us,” Carley said. The CHAIRity Auction on October 19 will be structured like “Project Runway,” but for furniture design. 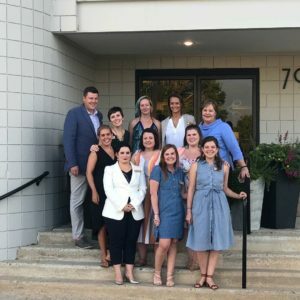 A group of 12 incredibly talented designers and influencers from the Richmond area have already chosen chairs from u-fab’s archives and the CARITAS Furniture Bank. They’re working with the u-fab fabrication staff to create a chair or set that will be auctioned off during the event. “We are looking forward to a wonderful event that not only celebrates art and design but raises money that will go towards transforming lives in the Richmond area,” Travis said. All of proceeds from the auction and ticket sales will go to CARITAS. Saison will provide hors d’oeuvres along with craft beer, cocktails from Belle Isle and fine wines by other local supporters. The event will take place at u-fab interiors at 7921 West Broad Street.